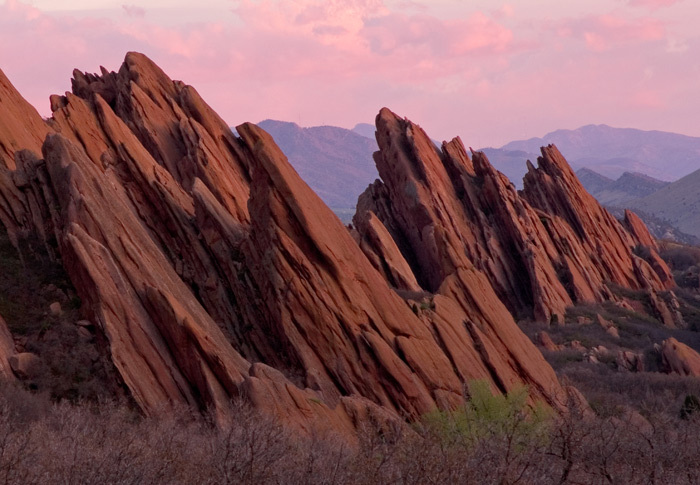 The best light to photograph Roxborough Park is at sunrise because the rocks turn orange/red and contrast well with the deep shadows. But trying to get a sunrise photo is difficult because the park is only open before sunrise a few days a month for a special event. And when they do open the gates early, there is always is a chance that it might be overcast. This photo was taken on one of those rare days when the park opened before sunrise at 5:30 am. I live in Boulder and had to leave my house at 4:30am, but the soft light and colorful sky I found when I got there made getting up earlier worth it. Photo © copyright by Mike Barton.